Dec 21 Follower Or Believer? When I think of the conversation Josh, Sean, and Sarah had (I say this because I said maybe 5 words the entire time), it makes me wonder how many people are actually followers of Jesus. There are tons of people that say they believe in God but how many of them actually go to church, participate in church events, or help the community? While this isn't necessarily a requirement of being a follower of Jesus so much as obeying Him, I want to know how many people actually follow Jesus? I can think of several people in my church alone that I only ever see on Sunday morning and never anytime else. I’ve attended parties and parades, prayer services, game nights, youth group, etc because it is nice to spend time around the people that share a common interest. Outside of a Sunday morning church service friendships are gained and accountability is maintained. People tend to put on a show; wear their nicest clothes and act a certain way. They get their gold star for attending church that week and live their life how they want the rest of the week. I remember when I first began attending classes on Thursday evenings at my church and there was a maximum of three or four other people there. It really made me frustrated that people didn’t want to learn about the Bible. There is so much information about the Bible that I wouldn’t know had I not attended the classes. Reading the Bible can sometimes be confusing and I simply could not have learned the knowledge I gained from those classes just by reading the Bible myself. While I understand that people have other things to do, where do we put our priorities? 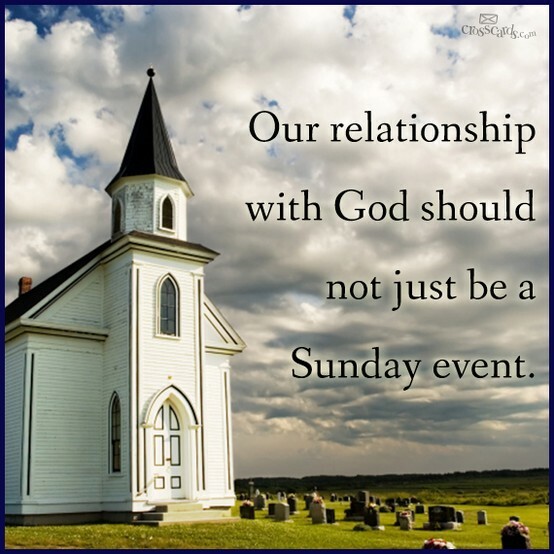 Do these so called Sunday-only Christians consider themselves followers or just believers? How can they go to church once a week and not want more? What’s the point? Dec 21 Which Comes First?